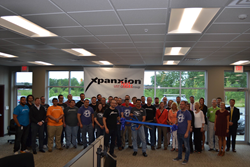 Xpanxion, a professional custom software services firm, held a ribbon cutting ceremony to celebrate the opening of the new Ames, Iowa office location. The new office will emphasize the importance we put on our employee centered culture, allowing us to focus on career progression, personal growth, and work-life balance. Earlier this week on Tuesday afternoon, Xpanxion hosted a ribbon cutting ceremony to herald the opening of their new Ames, Iowa office location. Construction of the site was completed early last month and the company had fully moved into their new location just a few weeks ago. Located near the interchange of I-35 and Highway 30, the new office space is over 9,000 square feet, allowing for anticipated future growth. Xpanxion previously held a location on 16th Street in the Golden Aspen Business Park which was opened in 2011. The new office will serve as a place where Xpanxion will continue to grow in upcoming years, and help to attract new talented employees and clients. This new office will feature an open environment, with employee lounges and break rooms, as well as multiple “team huddle” rooms and conference rooms. As one of Xpanxion’s few locations located within 45 minutes of a major airport hub (Des Moines International), this office will serve as the ideal venue to host Xpanxion clients.